After Hurricane Maria made landfall first in Vieques and Culebra and then Puerto Rico’s main island, the US territory lost 100% of its grid-linked power generation capacity. The only places lights were visible at night were where the scant amount of combustible fuel generators, or off-grid renewables remained viable, less than a fraction of 1% of the land area. Fuel was already scarce due to the generators’ use in the aftermath of Hurricane Irma. Estimates from authorities and the utility suggest it may take 6 months or more to restore power to all of Puerto Rico. Catastrophic storm damage and pervasive flooding pose grave risks to human health and safety. Stagnant floodwaters not only carry sewage and chemical toxins, but also are a breeding ground for bacteria, parasites, and can lead to deadly outbreaks of cholera, like the one Haiti experienced after its devastating earthquake. Without electricity, much of the storm relief work that needs to happen, to save lives and begin the process of rebuilding cannot get underway—pumps, cooking, transportation, refrigeration, medicine, all require some source of power. Authorities in Puerto Rico report that much-needed supplies are stuck in the Port, which is not operating, and cannot be extracted and distributed. The heavy equipment, along with the inventory and information management systems, that would allow the Port to operate require energy. The engineering work that would allow for rebuilding roads and bridges needs power and light, along with access to complex informatics that can compensate for harsh conditions in the disaster zone. Basic public safety requires power and light, both in buildings and homes, and also in the street. Chronic darkness, together with life-or-death desperation and short supplies, create conditions for violence and unrest. And on the most basic level, communicating with emergency services requires power. Hospitals require power. The USNS Comfort is being diverted to Puerto Rico, after former Sec. of State Hillary Clinton and leaders in the US Congress suggested that would allow for better assistance to hurricane victims in need of serious medical attention. Much attention has been placed on efforts to repower and clean hospitals, so they can be restored to full operations. What is missing from this emergency management effort is the effective deployment of solar microgrids. Distributed renewable power generation, not dependent on a large central grid, makes new kinds of adaptation to circumstance possible. Solar power makes it possible to harvest and deliver energy, without stored fuel supplies. Extend the hours during which people and communities would be able to work safely together. Power-up mobile communications, making minute-to-minute rescue information more accessible. Allow for storage of food and medicines that require refrigeration. Facilitate water purification and pumps for flood clean-up. Allow for fan-cooling or air conditioning, to prevent exposure of vulnerable to heat. All of these are life-saving services we take for granted. All of these make the work of recovery teams far easier—allowing them to remove physical and logistical obstacles and focus on actual human need. All of these restore rescue and rebuilding capacity to communities, where people are currently facing harsh, life-threatening conditions, and where they lack information, information management capabilities, and institutional control of life-saving resources. Wherever possible, those in a position to donate rapidly deployable solar microgrids and lightweight energy storage, should try to arrange direct immediate deliveries to hard-to-reach areas of Puerto Rico, Vieques, and the other islands devastated by Hurricane Maria. Responding to the extreme need for power generation across Puerto Rico, especially at hospitals and medical clinics, Tesla is sending hundreds of Powerwall batteries to the US territory. The batteries can be connected to small solar installations to speed up the process of restoring power to Puerto Rico, to accelerate the rescue and recovery effort. With most of Puerto Rico still struggling to access reliable restored power generation, Tesla is sending in solar plus storage installations to speed the deployment of new sources of energy. 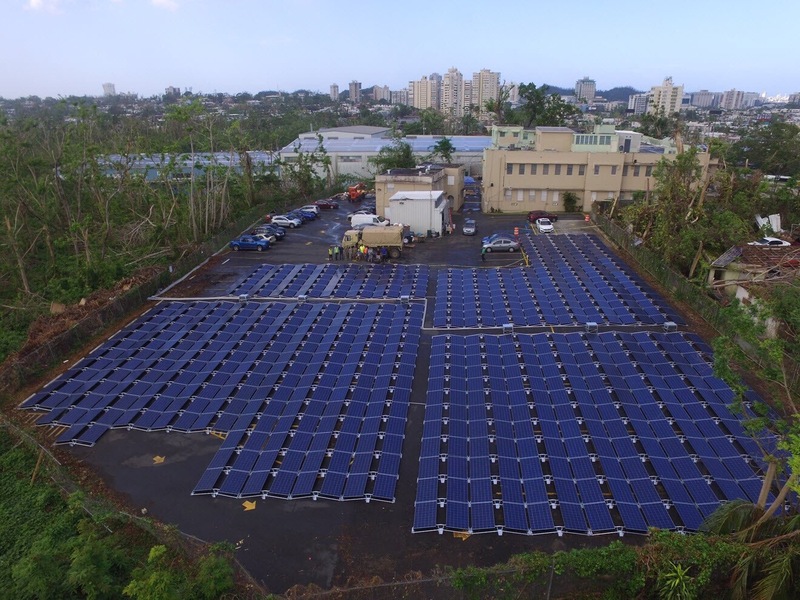 Sonnen, a German company, and Sunrun are also sending new installations of solar plus storage to Puerto Rico, to assist in the renewable repowering of the island. Previous PostThe U.S. at the U.N.